New Delhi (Sputnik): The Indian Navy's first domestically built aircraft carrier is expected to commence sea trials from early 2020, India's Ministry of Defense said after the country's defense secretary, Sanjay Mitra, reviewed the project, which has entered the final phase at Cochin Shipyard Limited (CSL) in Kochi. The ship was launched in August 2013 and the main propulsion plant, power generation equipment, deck machinery and auxiliary equipment have been installed and integrated on board. 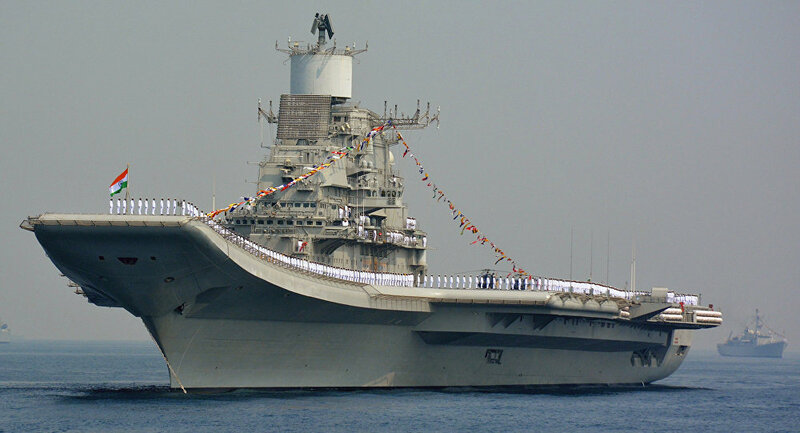 "In-house trials of ship's systems by the Carrier Acceptance and Trials Team have already commenced and the sea trials are expected to commence by early 2020," a statement issued by India's Ministry of Defense reads. State-owned shipbuilder Cochin Shipyard reiterated that the aircraft carrier, namely Vikrant, would be delivered within the given time frame, as the project has entered the final phase and the outfitting of the vessel with various aviation equipment, navigation and communication equipment, and weapons and sensors is progressing well. The design and construction of the indigenous aircraft carrier was sanctioned by the government in January 2003. The project faced a setback lasting more than eight years due to a delay in the procurement of major equipment related to aviation complex, including the arrestor and the withstanding gear from Russia. The 40,000-ton carrier has a length of 260 meters, which is much shorter than China's first domestically built 66,000-ton aircraft carrier named Type 001A (315 meters long). The Chinese aircraft carrier completed its first sea trial in May this year while its second sea trial will begin soon. Meanwhile, India's quest for a navy comprising three aircraft carriers is still a far-fetched dream, as its second aircraft carrier project is still awaiting approval from the Indian Defense Ministry.